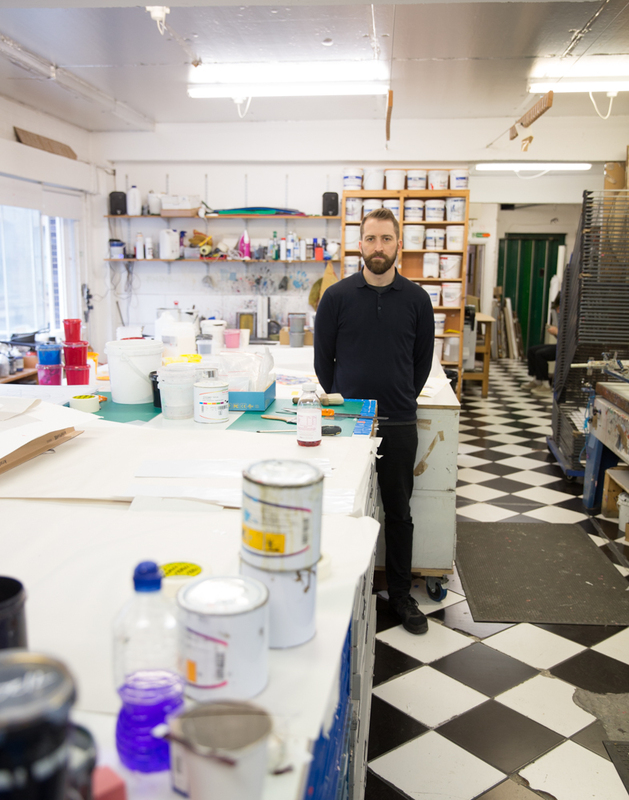 Born in East London, now living and working from Brighton’s rural outskirts, collage star Joe Webb, 41, swapped life as a graphic designer for a career as a full-time artist six years ago – and has never looked back. He talks to us around his first ever retrospective, ‘Lost & Found’, running at For Arts Sake until May 20. ‘Lost’ and ‘found’ is the method I use in creating my artwork. I find long-lost images from magazines and books in charity shops, cut them up and reassemble them as collages – bringing them back into view. The title also refers to how I was lost before becoming an artist. I didn’t know what direction to go in and ended up working as a graphic designer for a number of years. It took a long time to take a leap of faith and start working full-time in art. You first turned to collage six years ago. How did it all came about? After leaving art college in 2000 [Joe graduated with a BA in Fine Art from the University for the Creative Arts], I couldn’t see how I could make a living as a full-time artist. I wasn’t ready and I hadn’t developed my work fully. So I started working as a commercial artist and a graphic designer to pay the bills. It wasn’t until I’d become totally fed up with staring at a computer all day that I decided I wanted to return to art, and started making hand-made collages as an escape. What was the turning point for you in making the leap to being a full-time collage artist? I’d started to get some interest in the collages online – many of the pieces had gone viral, being shared 200,000-plus times in some cases, so I figured that maybe I was on to something. 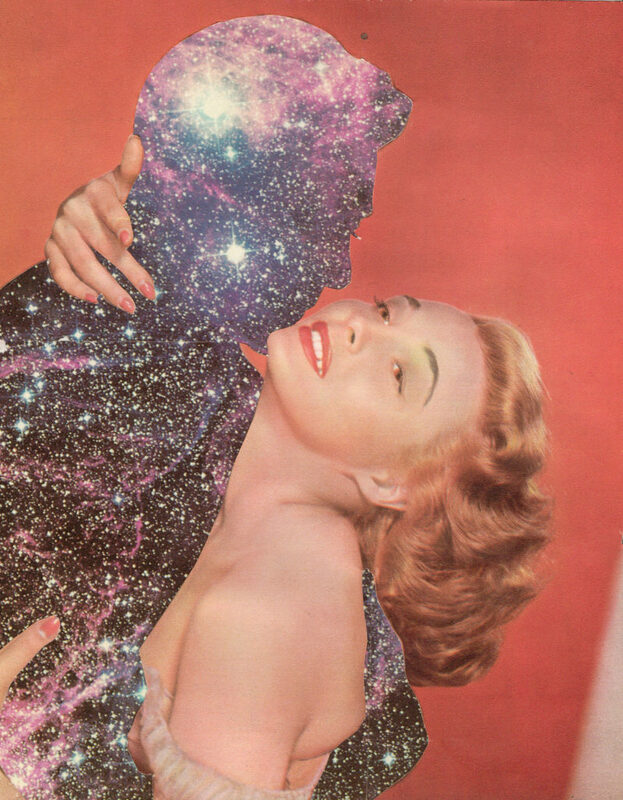 Then I entered one of my collages, ‘Antares & Love II’, into a competition at the Saatchi Gallery. To my utter surprise it won and I was offered an exhibition there a year later! It wasn’t a tough decision after that as I knew it was something that I just had to do, no matter the consequences. It sort of goes to show that if you want to do something and you have a passion for it you should just go for it and not always take the sensible option of ‘oh, I’ll just work in this job, it’s a bit creative’. If you want to be a musician, be a musician; if you want to be an artist, be an artist. Life’s short and you should just go for it. Have you always been fascinated by retro and 1950s imagery? I’m drawn to 1950s imagery as it was a time when advertising was projecting this fake sugar-coated version of life. I find when I juxtapose real life imagery it scratches through the 1950s picture-perfect veneer and exposes the reality of what really goes on in the world. Sigmar Polke, Peter Doig… visiting an exhibition of these artists made me want to get into art again… and Robert Rauschenberg. His use of silkscreen on canvas, using political imagery to make almost abstract paintings, really influenced my approach. Where do you find inspiration for your prints? Mostly old books and magazines I find in second-hand shops…there are a lot of them where I live near Brighton, fortunately. Friends also tend to send me books they think I could use. Is your house basically just floor to ceiling stacks of old magazines?? Yes. It’s becoming like one of those TV programmes you see on Extreme Hoarders! Could you talk us through the process of creating a new work, from beginning to end? I’ll cut out and store images I think I can use. This could be a background image or a single element. I try to file them, although it’s hard to keep track of hundreds… so I often lose or forget about them for a few months. Then I may find another image that I know will work with something that I cut out – and the search begins to find the thing I cut out months before! How long would the creation of a new print typically take? All of my prints have to be hand-made; I’m not a big fan of digital prints – it’s too easy and the result is often a little soulless. Silkscreening is a long process… it can take weeks to months to produce an artwork. It’s a process used by my art heroes Rauschenberg and Andy Warhol. You push ink through a silk mesh that has a stencil burnt on to it, though a photographic process. You have to build up layers of colour and make decisions along the way, problem-solving, as it’s an imprecise way of printing. That’s the charm of it, though – you can see the artist’s journey in making the artwork and fixing the problems that arise as it’s made. Both my prints on paper and my canvas works are made in this way. How do you think having been a graphic designer feeds into and influences your work now? I guess it trained my visual awareness. I understand how to balance imagery and how to make an impact visually. Given that this is a retrospective, how would you say your works have changed and progressed over time? I don’t think they’ve changed that much: some of my earliest works are my favourite pieces. I suppose I’ve just developed ideas and themes more and explored other avenues. I want the work to be coherent and not to jump from one style to another. Which new works are on show? There’s a series of original collages that haven’t been seen before; they have a more political edge to them perhaps. I’ve also produced a new silkscreen limited edition based on one of my most popular collages, ‘Stirring Up A Storm’. There’s an edition of 75 and a special ‘Diamond Dust’ version of 25. 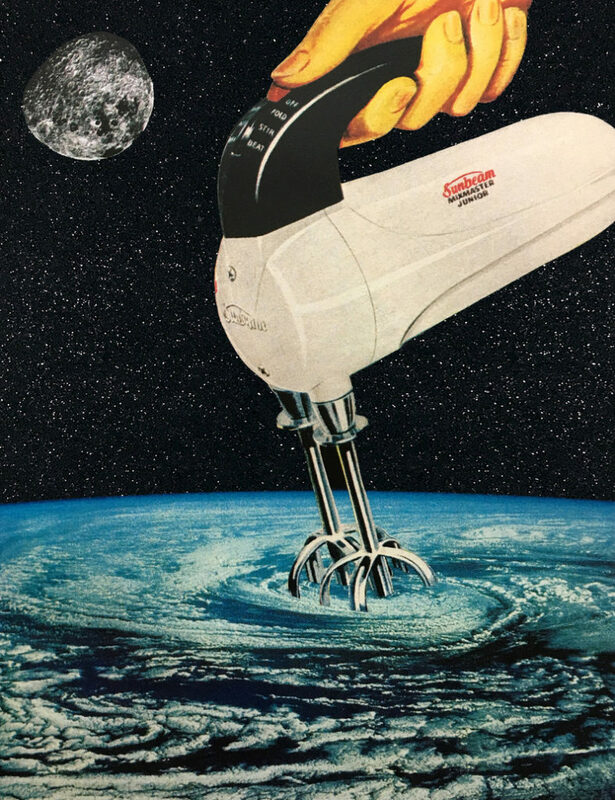 The piece features a giant hand and whisk, causing a storm on Earth. It’s an observation on how humans are affecting the planet though our wasteful and throwaway lifestyle. And the original Saatchi artwork, Antares & Love II, is also on show. Could you tell us a little about the inspiration behind it? Yes, we are displaying a selection of my most favorite collages, which aren’t necessarily all for sale but will help viewers understand my progress. ‘Antares & Love II’ looks at the vastness of space and the universe and questions our place in it. Antares is one of the largest known stars. You use different textures and finishes in your work, such as diamond dust – where did this method come from? Diamond dust is a material used by Andy Warhol in his silkscreens. It adds another dimension and point of interest. It emphasises certain elements of the work, and can represent the magical feeling of a night sky. It’s added by hand by literally gluing it into place over the silkscreen. 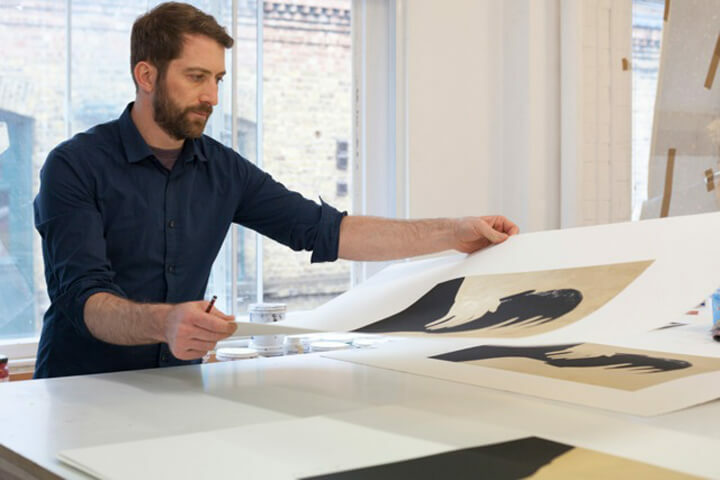 Could you explain something of how your collaboration with the fine art printmaker and publisher Coriander Studio came about, and how that process works? I approached them after seeing the amazing results they can achieve through silkscreening. They really push the boundaries of what can be achieved with silkscreen, collaging and cutting out areas, adding holographic elements to the prints and, of course, diamond dust! They work with a lot of favourite artists of mine, including Sir Peter Blake who I got to meet a number of times. It was amazing seeing how he worked and his passion for art. I now also work with Jealous Gallery a lot, and recently Brighton-based Private Press. When I make editions of 50 to 100 I like to work with print houses. They are experts in making editions. When it comes to the canvas works, I paint and silkscreen them myself. I approach them as I would a painting, and wouldn’t want anyone else working on them. You live and work near Lewes – have you always been down on the south coast or did you make the move after pursuing art as a career? It was a little time before, around 12 years ago. I wanted to find somewhere quieter to live and work after spending most of my life in or around London. The South Downs and the sea are my favourite places to spend time. Messy! It’s a converted barn in the middle of nowhere, which is good and bad – there are no distractions around me and I can get lost in my work for hours. But sometimes I think a coffee shop nearby would be nice! I need a lot of space for all of my silkscreening equipment, and with the crazy property market being the way it is there just aren’t any studio spaces in Lewes or Brighton big enough for me to work from. It’s a real challenge for artists to find an affordable and suitable work space in the south east. What gets the creative juices flowing? Tea and biscuits? Any particular kind of music? I think Picasso said inspiration can come along at any time, but it has to find you working. On some cold mornings I just have to throw myself down into the studio and get started. I love a working to jazz music – John Coltrane in particular. So much so I’m trying to learn to play the saxophone myself! You have quite a celebrity following – with a good few famous collectors. Who was the first? I think it was Eric Cantona. 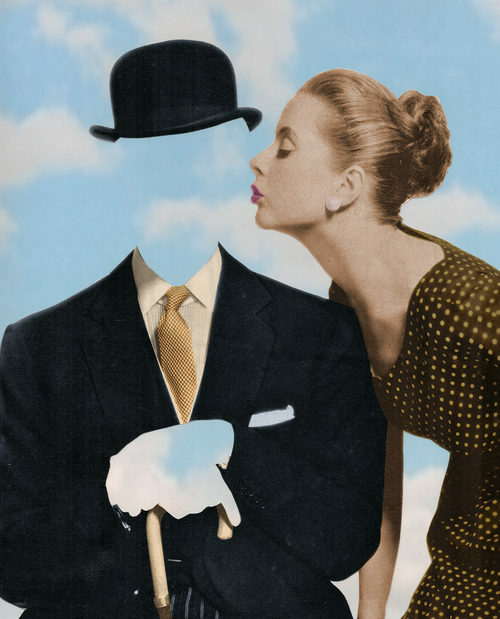 He bought ‘Kissing Magritte’ from the Saatchi! Could you tell us about the Coldplay connection? The directors of their ‘Up&Up’ video cited my work as an influence. I had some contact with the band and their manager, who bought some of my paintings from me. And you’ve created album covers for Janelle Monae and Tears for Fears, among others. How did those commissions come about? The record labels just get in touch. I think the sharing power of the Internet has bought an awareness of my work to the music industry. There’s a keeness to bring back the iconic record sleeve, rather than just using a photograph of the band. Maybe it’s linked with vinyl becoming popular again. You describe your works as ‘collages with a message’. What is that message? Each piece has its own message. Some are political statements, or observations on the world and how it works. Hollywood features heavily in many of your works – is cinema a huge influence? I think the work has a cinematic quality to it, again perhaps because it’s expressing an idea or a story. You’ve described yourself as being fairly anti-technology yet you are hugely active on Instagram and online – how do you marry the two? I’ll post a collage every day or so, but don’t get involved online arguing on Facebook etc. I just post then get out of there! It’s a great way to share my artwork with a lot of people around the world. I guess there’s an interest in the ideas behind the work, and the fact that it’s visual and can be easily understood appeals. Is an element of humour important in your work? I find having an element of dark humour makes the work more palatable. Perhaps it’s easier to deal with for people. I can be dealing with some pretty dark issues so to emphasise the ridiculousness of the situation can help, otherwise it can be too harrowing. I find the more simple and consise the process, the more impact it has somehow. I’m always looking for that magic moment of serendipity where images just work and an idea is expressed through placing two or three pictures together. The ideas in the collages are a reflection of where I’m coming from in my thoughts and feelings about the world. I try to address social, environmental and political issues that are on my mind or on the news; I’m trying to address things rather than shy away from things. What themes appeal to you most? Space, humans, the world! I’m really just amazed and interested in space and it’s something that levels us; a reminder that we are this speck of dust in this massive universe and really we are qute insignificant in the grand scheme of things. You have introduced painting into your body of work – is that a future path or will you continue to combine painting with screenprint and collage? Yes, I wanted to find away of making the collages bigger without resorting to digital means. Silkscreening is a great hand-printing method of enlarging the works… the canvas pieces are somewhere between a painting and a print. There’s a lot of work that goes into making them, it can take months to finish just one. Were you perpetually covered in glue and felt tip pens as a kid? Yes that was me. I was always making things out of cardboard boxes and drawing. Now it’s my kids! You once said you wish you were born 100 years go? Why? Ha, I did? I just meant I would like to live in a more simple time, with less digital clutter, emails and general hecticness. Which is your favourite of all your works so far? ‘Stirring Up A Storm’, ‘Cloud Eaters’, ‘Hot Tub’ – these are the more simple but politically charged pieces that I made a while ago. What’s next for Joe Webb? I’m making more large-scale works on to canvas and have an exhibition lined up at 45 Park Lane in August 2018. 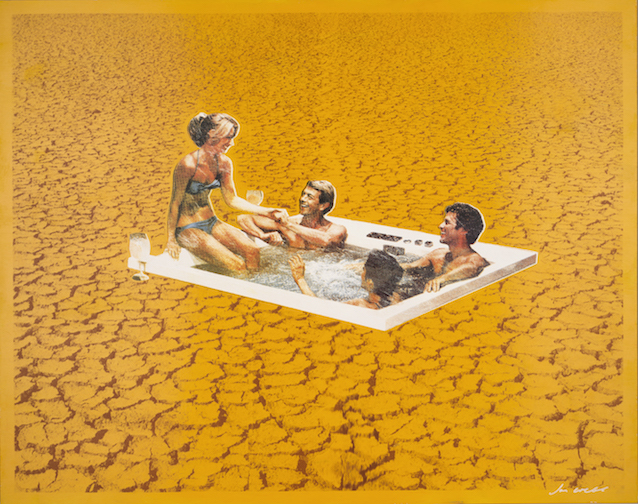 Joe Webb, ‘Lost & Found – A Retrospective of Silkscreens and Collages’, For Arts Sake, free entry, April 27 – May 20, 45 Bond Street, Ealing W5 5AS, Mon-Fri, 10am-5.30pm, Sat 10am-6pm, Sun 12-5pm.